As the sun rises over the small colony of… Holland… all is well. It’s a warm day, lightly foggy after yesterday’s rain, and Sheckley, a 34-year-old Graphic Designer, has just got out of bed. Slinging his scavenged bolt-action over his shoulder, he leaves to catch something for the colony to eat. Standing on the border, he aims his rifle steadily at a passing Alpaca. Its meat will prove delicious, its fur insulating. Just before he takes the shot, the unthinkable happens. Manhunter Rabbits. A huge pack of critters surges in from the east, a sea of them sprinting towards Sheckley – out in the open and helpless, caught in the searing gaze of their collective wrath. He tries to run, but it is too late. Their power proves too much for him, and he succumbs to a biting, writhing mess that tears him slowly asunder. My other colonists watch on, horrified by what is happening just outside their walls. Derren, a 73-year-old psychopath, leaves the colony with a Molotov cocktail, tossing it into the amorphous blob of lapin rage, burning both them and poor old Sheckley alive. 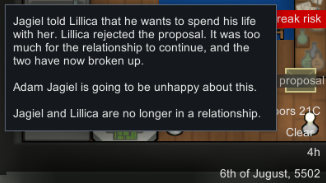 All is not well in the colony. 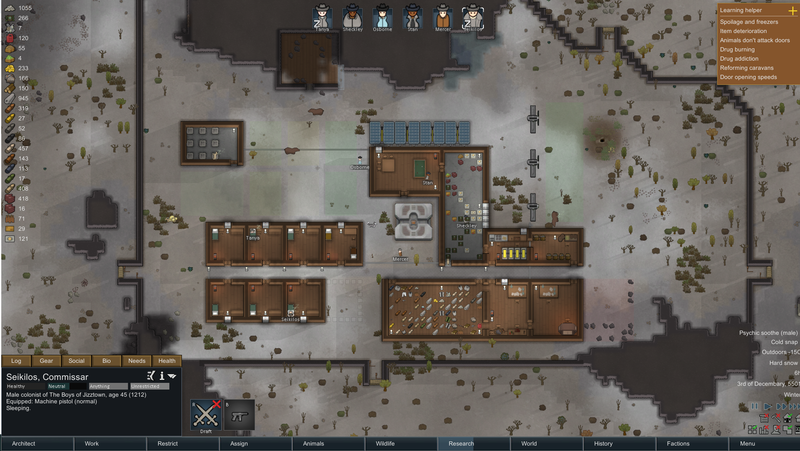 When starting a colony in Rimworld, the player is overwhelmed (just as Sheckley was) with a bewildering bombardment of odd narrative arcs, strange occurrences and comic losses. This is one of the very first things that happened to me when learning the ropes of the game, and as I delved deeper into the systems on offer, the game opened up its storytelling arms accordingly. 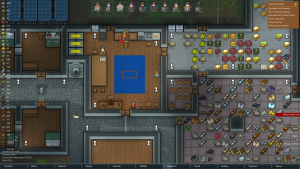 I fondly remember the time I had to lock a colonist in a small box to shake a chronic alcohol addiction, or the time that I bought a bear called ‘Unit’ from passing slave traders, only to have him eat my entire food supply in under an hour. I enjoyed the fruits of running an interplanetary drug trade, and the moral degradation of running a psychopath-fuelled organ farm. I remember the loss of my sharpshooter, Tater, who caught a particularly nasty disease whilst rescuing a prisoner on a daring mission. Rest in peace. A frozen winter; the bodies will pile up. I realise I’ve managed to get 350 words into this article without actually describing what Rimworld even is. 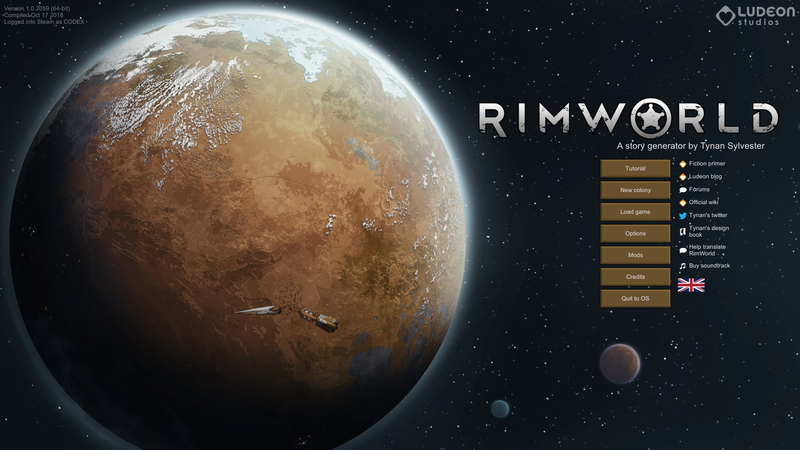 To put it briefly, Rimworld is a game about managing a colony on a dangerous alien planet. Your crash-landed survivors will start with nothing and slowly build upwards – gathering more resources, followers and commodities until eventually constructing a spaceship on which to eventually leave the god-forsaken hellhole that acts as your home. 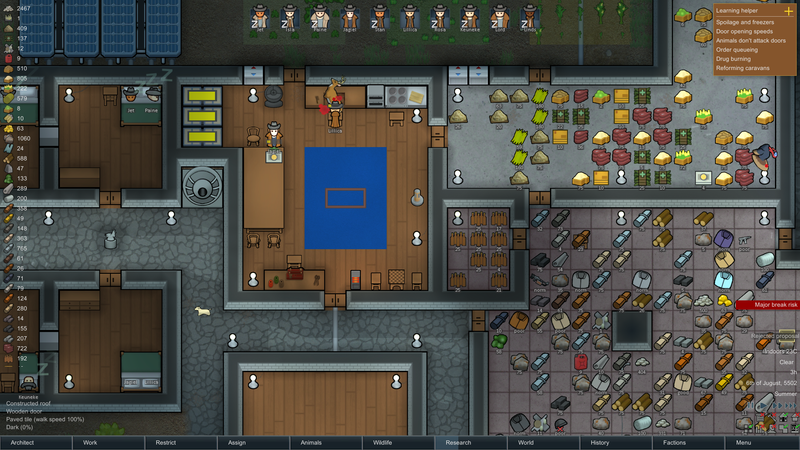 To describe the game in this way is not to do justice to what Rimworld actually is – a game that positively bombards you with rich, enjoyable and (most importantly) personal narratives. Every single one of the systems in the game is tailor-made to provide you not with the smoothest gameplay experience, or most direct route to ‘winning’, but instead to provide hilarity, despair and entertainment in equal measure. The creator, Tynan Sylvester, recommends the game be played on a mode where your choices are permanent – and after my initial resistance I was surprised to find how much I loved the game when any tiny mistake can prove absolutely disastrous; it made the game simultaneously nail-bitingly tense and absolutely hilarious. 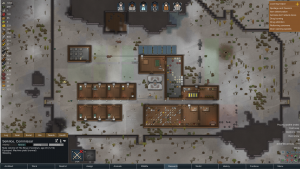 For me, Rimworld scratches an itch that used to be scratched by cult classic Dwarf Fortress, a game as enjoyable to play as it is headache-inducing to observe. Both games pride themselves on these player-created narratives, only Rimworld tightens up and graphically-overhauls the experience to make it a little less daunting to get involved with. It doesn’t, however, lessen the potential and experience on offer in Dwarf Fortress (arguably its spiritual predecessor) one bit. You can still attempt the insane in Rimworld and get away with it, such are the systems in the game – so complex and strange that the only limits are within your twisted mind. Do you want to outfit an entire colony in human skin? Go ahead, the game enables all sorts of garments and furnishings to be made from the corpses of your enemies. What about a colony where one lone survivor lives in harmony with one hundred domesticated turkeys? Also entirely possible (and indeed popular within the game’s thriving community). How about making a colony that thrives on its monumental production of beer, or one that deals exclusively in cowboy hats, or maybe even an intergalactic arms dealer? All possible, all hilarious, and all strangely viable. A cosy morning out on the rim. The replayability present in Rimworld is just as insane as the systems it touts – with three different AI ‘Storytellers’ with distinct personalities to manage how hard your game is to a treasure-trove of community mods, the only limit to the hours you can spend in Rimworld’s digital hellscape is your own imagination. It’s mad to think that I’ve easily plugged 50 or so hours into Rimworld in just a week and I still haven’t even finished the game. None of my colonies have actually managed to escape the planet they hate to call home before I’ve decided I want to start afresh relying on a new gimmick; maybe a psychopath-only run, or one in which all my colonists begin with some kind of addiction. The (Rim)world is indeed your oyster, as your observe the fates of those unfortunate enough to exist under your cursor with the manic glee of an all-powerful God. So, is Rimworld a game for you, dear reader? Well, maybe. Personally, I cannot recommend it enough – its such a great piece of game design with a disgusting amount of replayability and wicked sense of humour. However, it does have a fairly steep learning curve and unconventional control scheme for those not familiar with similar games in which you don’t really have direct control over your characters. If the idea of doing any of the above antics appeals to you, if you enjoy ‘reactive’ game systems and sandbox stylings then take the plunge, as, for me, Rimworld is the absolute pinnacle within its class – the most accessible and, I would say, enjoyable game I played last year. It’s just reached version 1.0, the subreddit is thriving and honestly there is no better time to start than now – so why not crash-land into this absolute beauty of a videogame. Rimworld is out now on PC.